Not much new to report, fishing is great and there are lost of Steelhead in the river. Here are a couple pictures from the last few days. Steelhead fishing on the Muskegon River has been good, there are good numbers of fish around right now with some fresh ones mixed in with a good number of spawned out fish. Water level has dropped to around 2,900 cfs. and visibility is about 2 to 3 feet which should spread some fish out away from the spawning gravel enough to spread out some boat traffic. Here are a couple pictures from today and yesterday. 4/27/2014 Mike with a nice buck from today. 4/27/2014 This fish put up a heck of a battle. 4/27/2014 Linda did a good job bringing this fish to the net. 4/26/2014 Mike and Matt with a double header. 4/26/2014 Ray with one of his fish from the morning. 4/26/2014 Ed with a nice buck. 4/26/2014 Ray with one under blue skies. 4/26/2014 Float fishing was outstanding. Here are a couple of the fish we landed on a very good day of fishing today. 4/25/2014 Fred with a hefty fish. 4/25/2014 Rick with a nice buck from today. 4/25/2014 Fishing was great today. 4/25/2014 Natalie got out for a couple hours this afternoon and caught this beast. 4/25/2014 Natalie with one from this afternoon. 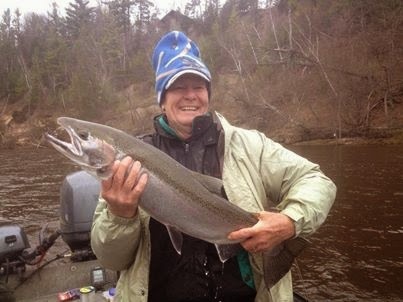 Steelhead fishing is good, water level is 4,600 cfs. and clarity is still muddy. There are good numbers of fish in the river with a mix of fresh and darker fish with dropbacks mixed in as well. Here are a few pictures from the last two days. 4/24/2014 Double header to end the afternoon trip. 4/24/2014 Bob with a great fish from this afternoon. 4/24/2014 Chris with one of his fish from this afternoon. 4/24/2014 Mark with a nicely colored buck. 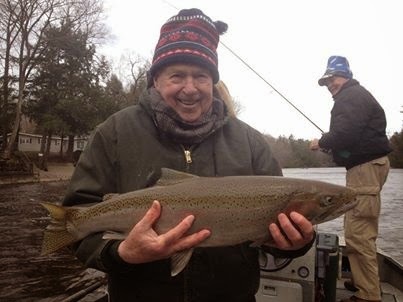 4/24/2014 Jim with one of his fish from today. 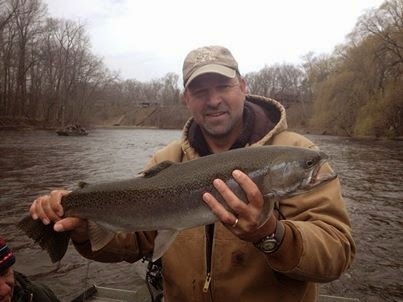 Steelhead fishing has been good and there are a good number of fish in the Muskegon River. Water has dropped to around 6,000 cfs. but is still very dirty with only about a foot or less of visibility. Here are a couple fish pictures from today and yesterday. Steelhead fishing has been great for us lately. Flood waters on the Muskegon River are receding and we are fishing there again after spending the last week on other area rivers due to boat ramps being shut down on the Muskegon. Water level is high at 7,000 cfs. with very heavy color and water temp is in the low to mid 40's. There are fresh fish mixed in with older winter holdovers and new fish will continue to show up for the next few weeks. Here are a few pictures from the last few outings. 4/20/2014 Gerald with a nice buck from today. 4/20/2014 Gerald jr. with one of his fish from today. 4/20/2014 Austin with his first Steelhead. 4/19/2014 Brett with a nice fish he caught float fishing. 4/19/2014 Breton with his first ever Steelhead. 4/19/2014 Float fishing was good yesterday.